How to repair Outlook? | How to repair pst file or files of Outlook step-by-step by use Outlook Recovery Toolbox? How to recover a corrupt Outlook data file if there are problems with it or if it is cannot be read? 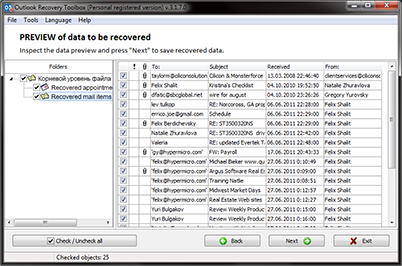 You can recover the data of your PST file in several steps using the Outlook Recovery Toolbox (download) tool. The tool recovers data from PST files that Outlook cannot read or reads incompletely. The program scans the source Outlook PST files, identifies information stored in it (messages, contacts, notes, etc.) and saves this information to a new PST file. Also, the program can save messages, contacts and notes to separate files: eml, vcf and txt respectively. Below you can read how to repair pst file. The user should enter the name of the file manually or click the button. If the current user has several Profiles, he or she can select the Profile data from which should be recovered. If the selected Profile stores data in several .pst files, the user has to select which PST file should be recovered. Also, the user can select any PST file from the disk for recovery. If the current user has only one Profile and only one file in this Profile, it will be displayed in the input field at once. The program can read PST files of Outlook version 97 and later. The Outlook pst repair software can recover only one file at a time. If it is necessary to recover several PST files, you should go through all steps several times. If it is not known where PST files are stored, the user can use the file search feature of the program or use the search feature of the operating system. After you select the file you want to recover, the Outlook pst repair tool will start to read the source file and identify the data stored in it. The time of scanning depends on the size of the file and on the performance of the computer used for the operation. After the program finishes scanning, it will display all Outlook folders found in the file in the left panel and objects present in each folder in the right panel. The user should specify a folder on the disk where the recovered data will be stored. The size of the free space must be two times greater than the size of the source PST files. If the recovered data is saved as PST files, the size of the target files will be less than or equal to 1GB. To start saving data, you should click the Save button. When data is saved as PST files, the program backs up the source PST file in the storage folder (after the process of saving is over, the backup copy will be deleted). 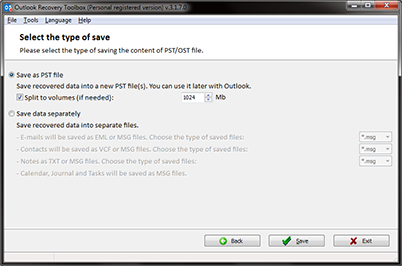 If you need to save data as a PST file, you must have Outlook (not earlier than Outlook 98) installed on the computer. After the recovery process is over, the program displays the final report. Repairing Microsoft Outlook files complited. The tool read pst files of Outlook 97, Outlook 98, Outlook 2000, Outlook XP, Outlook 2002, Outlook 2003/2007/2010/2013. The tool crate new pst files under Outlook 98 (Outlook 2000, Outlook XP, Outlook 2002) or Outlook 2003. Outlook Recovery Toolbox is the answer on question: How to repair pst file of Microsoft Outlook? 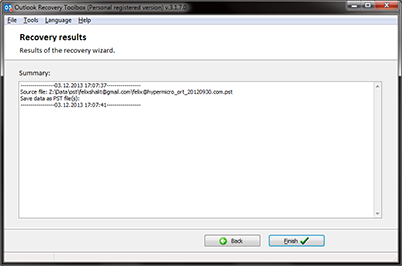 Outlook Recovery Toolbox is easy to use PST recover software. Tool repair Outlook files without a modifing the source pst files. How to repair .pst? How to read PST files without Outlook? 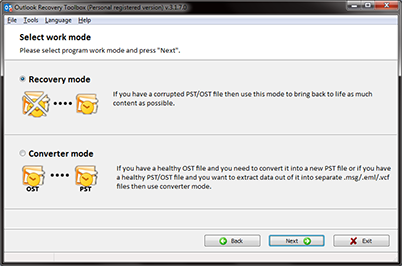 Outlook Recovery Toolbox allow to read damaged PST and OST files without Outlook. But if you want to save a recovered data into new PST file then Microsoft Outlook must be installed on PC. How do I open a pst file without Outlook? Just start Outlook Recovery Toolbox and program can open pst files, include damaged and/or corrupted. Outlook Recovery Toolbox is the program to open .pst files and fix it. How to repair Outlook file? You can easy repair damaged Outlook PST file by run Outlook Recovery Toolbox.